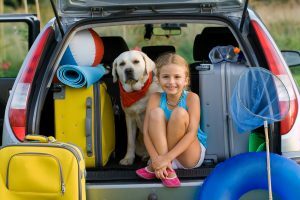 If you’re planning to take your dog along on your next holiday, there are some important preparations that need to be made before you leave home. Protect your dog against parasites. Your own garden may be parasite-free (or so you think) but if your holiday includes hiking, visiting nature reserves or walks in parks and gardens, it is imperative that you protect your dog against ticks and fleas. EberVet Vetshops and veterinary clinics stock a wide range of anti-parasite protectives. But do ask for advice. The product you choose will depend on your dog’s age, life stage and lifestyle and remember, never ever use a dog’s flea protection on a cat. It is toxic to cats. Wash and groom your dog before you leave. You may have chosen a pet-friendly guesthouse or camp site but they won’t be so friendly after all if your dog is dirty and smelly! Make sure your dog’s lead and collar/harness are in good order. The last thing you want is the lead to snap while you’re out walking or hiking in a nature reserve or park unfamiliar to you or your dog. And you never know how many other dogs you might meet along the way; it is always better to be safe than sorry. Pack food, snacks and a water bowl and bottle of water for the car. If you’re driving long distances, remember that just like you dogs get thirsty too. Stop every two hours to offer your dog water and a chance to use the big outdoor lavatory and don’t forget to pick up any ‘landmines’ he may leave behind. Make sure you have a stash of small bags for this purpose and carry them with you on your hikes. There is nothing more distasteful to fellow hikers than stepping in dog poop. Pack toys. You may be looking forward to doing nothing but staring at the scenery for a while but dogs are easily bored. Pack his favourite toys, and a couple of new ones, to keep him occupied while you are resting. Don’t forget his bedding. The familiar smell and texture of his bed from home will give him comfort when in a strange place. If you can’t haul the whole bed along, pack a favourite blanket. Ensure he has enough space. He will need to lie down to rest comfortably, and to sit up and see out of the window. And make sure he has access to fresh air. This will help if he is susceptible to car sickness. Ask your vet about a sedative or car sickness remedy. Not all dogs are good travellers. If yours is anxious in the car or is prone to motion sickness, your vet can prescribe medication to help. Do your homework for pet friendly holiday destinations. Never assume that just because you adore your dog, a guesthouse will too. Check out those listed on www.afristay.comor www.travelstart.co.za.